Established in 2006, iCasque's online store draws on the Pasquetti family's more than 60 years of experience in the Motorcycle world. 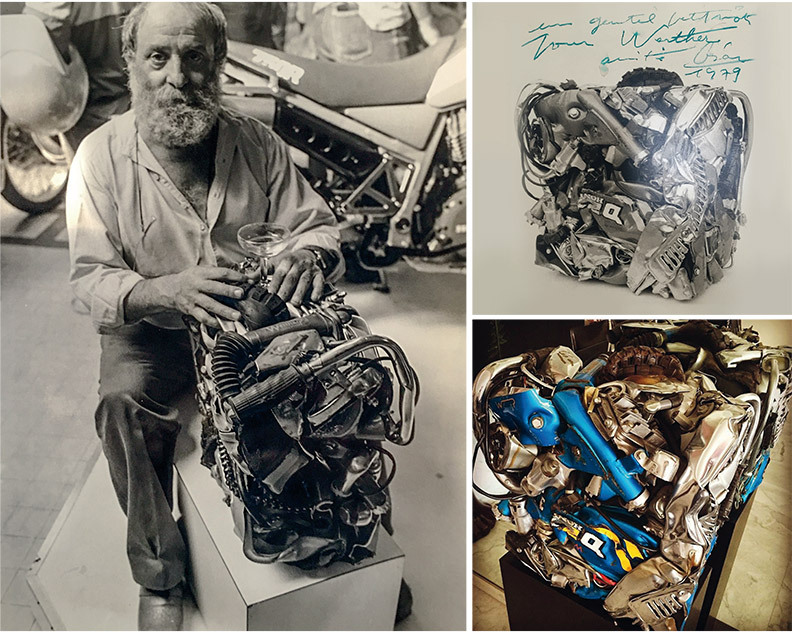 Central to the history of the company, is the story of founder Werther Pasquetti, whose passion for all things Moto lives on in the company he created. The son of an Italian migrant, with no academic background nor a penny to his name, Werther nevertheless proves himself to be an astute businessman. Rue Barla the repair shop continues to grow, but Werther decides to launch himself into motorbike sales. In 1958, he gets the distribution rights for Paloma then Ducati, Derbyand Malaguti. In total he will become an officially recognized distributor of 13 major European brands. The business continues to expand but does not satisfy this passionate entrepreneur's hunger for success. In 1963 came the big turning-point, Werther sensed sooner than anyone that the Japanese were going to turn the motorcycle market on it's head. A shrewd businessman, he casts out the European brands in favour of becoming the first Honda dealer in France..
Two years later he will be officially named a Honda Concessionaire. And Werther and Honda, are the perfect pairing. 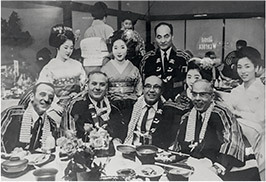 The founder of the Honda Motor Company, Soichiro Honda, establishes his empire in 1948, the same year that Werther opens his repair shop. Both men go from rags to riches, are inventive and ambitious, and Soichiro Honda will go on to be the father of a multinational corporation known the world over. The two men, despite the language barrier, share a passion for auto mechanics, and a friendship is born. The Rue Barla, this effervescent, vibrant street in the Port quarter of Nice, hops with humanity and rolls to the rumble of motorcycle engines, and has at it's heart a place for all aficionados, beginners and everyone in between to discover the latest models, ask for advice and generally talk motorbikes! The seventies and eighties would prove to be a golden age for Werther with a boom of activity that would demand upsizing the store. At this time the business also expanded into Motorcycle Accessories..
Outside of Nice too word began to spread, and Werther and his wife Carmen began to receive at the store celebrities from all over the world. 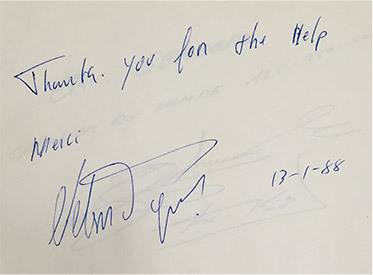 The guest book overflowed with messages of friendship from myriad, wonderful artists and stars. 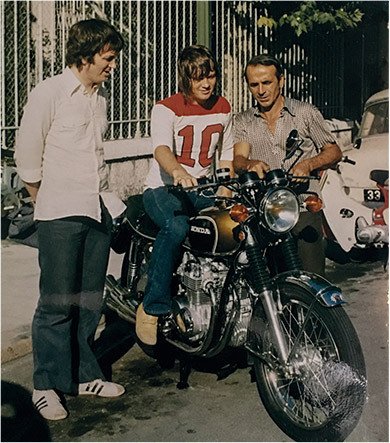 Among them, French icon and motorbike enthusiast Johnny Hallyday would pass by whenever he found himself on the Côte d'Azur. In addition, we were fortunate enough to be able to welcome the marvellous Sophie Marceau, superstar actress of French cinema, who graced the store with her natural charm and elegance. French César-winning actor Jean-Paul Belmondo, actor-composer Georges Moustaki and the sculptor César were also familiar faces around the place. The former would become a real family friend, on one occasion, César managed to convince Werther to crush two new Hondas with 0 on the mileometer. Imagine the suffering of this motorcycle-lover seeing his machines squished down into a pile of mangled metal never having rolled a metre! These two crushed bikes, preciously guarded by the family, have been valued at more than 150 000¤ each! 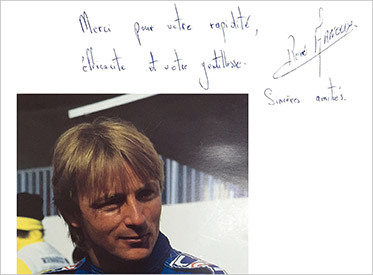 Of course a number of sporting personalities also passed through the Honda Werther front door, notably a handful of Formula 1 drivers such as Frenchman René Arnoux and legendary Brazilian Nelson Piquet triple world champion. 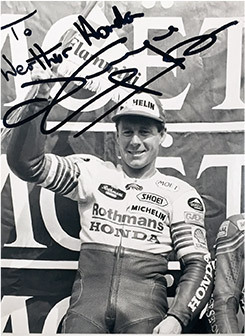 Werther also supported various local racing teams and had his own team of riders for the local tracks, as well as bike-builder par excellence, Sauveur Génovèse. Sauveur, in addition to being Werther's principal mechanic, was his brother-in-law and trusted right-hand man for many years. 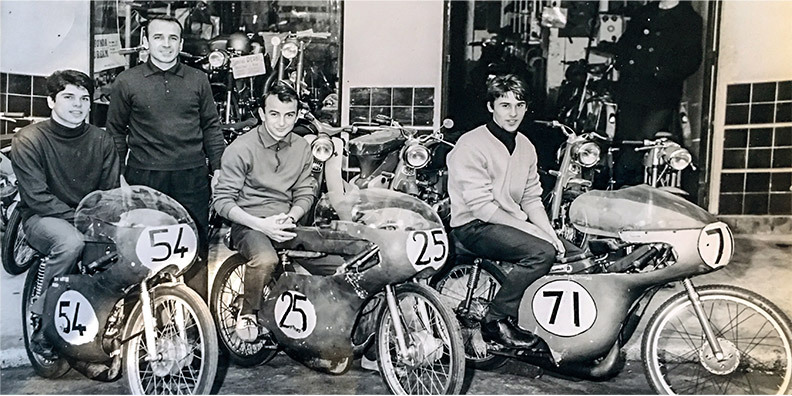 A family of revheads if ever there was one, the Pasquetti family continue to follow the MotoGP and other competitions around the world. Werther's wife Carmen still enjoys recounting their misadventures on the Isle of Man while following the Tourist Trophy. 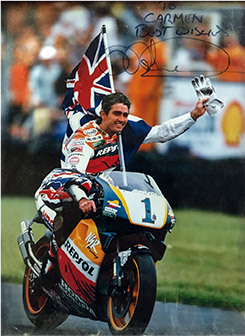 Each time they would return home they would be laden with souvenirs and new connections with riders such as Wayne Gardner and Mick Doohan. These two between them collected six MotoGP World Championships. As the years rolled on, Werther progressively passed the management of the company down to his children. Nadia, the youngest, took charge of the accounting side, while Gérard the oldest, who had raced bikes himself in his youth, took on the mantle of director. The second generation got to work, ever under the watchful eye of Werther. At the end of the eighties, the appetite for Honda quality had not at all abated. However, the mindset of motorcycle customers was evolving. More and more, customers wanted a motorbike not only for recreation, but as a means of commuting. 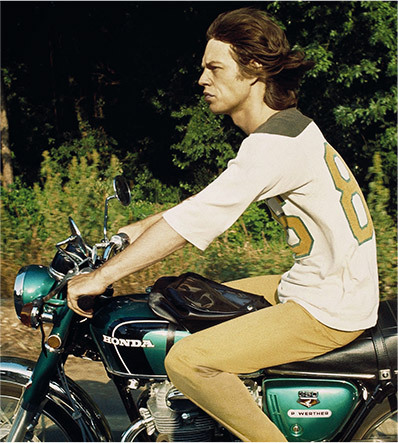 From this point, Werther Honda found itself providing around 2.000 bikes and scooters per year making the store the second-largest outlet in France. Werther himself was a well-loved character around Nice, which was profoundly demonstrated in 2001 when the city rendered him a stirring tribute following his tragic disappearance. This sad event marked the end of an era. Then, five years on, Werther's son Gérard would take the company in a new direction, launching the iCasque online motorcycle helmet and accessories store. In a similar vein to those start-ups that begin life working out of a garage, the website iCasque began life working out of the Honda Nice store. In the beginning, iCasque dealt only in helmets and with a limited range of brands. The early days were rather tentative, with only one helmet sold in the first month, and thirty in the first six months. Then came the time for the third generation of the Pasquettis to get involved; Jeremy at first, then his cousin Marine, charged with managing the exponential growth of the online site. And the young Pasquettis have kept to what served their parents and grandfather so well: genuine know-how, quality gear from the best producers around, attractive prices and personal customer service. Customer satisfaction is, and will remain, the group's priority. 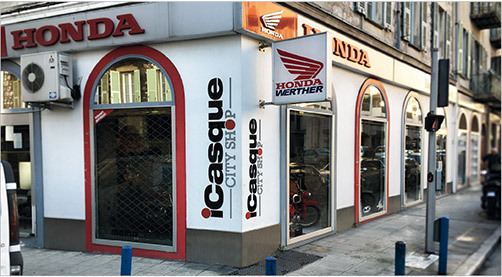 Double-digit growth since the launch of iCasque led to its reconstitution as «Internet Creative Company (ICC)» in 2010, a business entirely apart from the Honda Werther store. 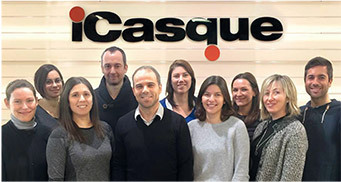 2010 was thus a transitional year for iCasque; a new legal standing added to the acquisition of a new depot from which to be able to store and ship the newly enlarged range of products (jackets, gloves, trousers, overalls). The online site was from this point dealing the whole gamut of motorcycle accessories from around one hundred different brands. Then, basing their choice on the company's excellent reputation, ICC conferred the logistical aspect of the enterprise upon Morin, a Lyon-based company recently taken over by Viapost. 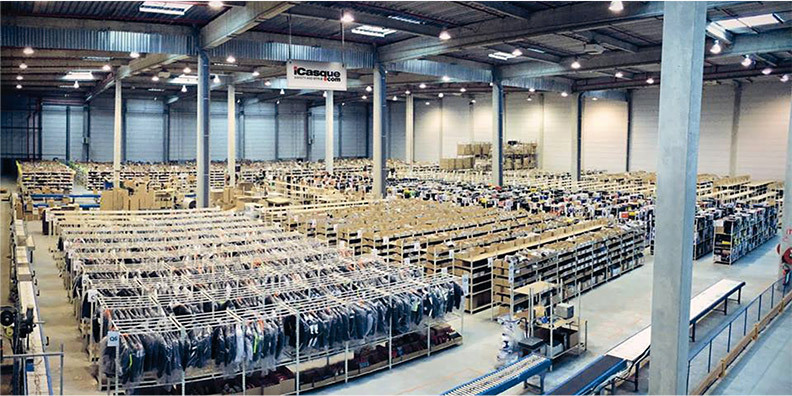 This highly-esteemed logistics agency counts among their other clients: Spartoo, RueDuCommerce and MonShowroom and galvanises ICC with around 2.000 m² floor space and worldwide delivery of ICC's online sales. Of course ICC's headquarters remain in Nice, maintaining the close connection to the original Honda Werther centre. Nice is also the centre of the administrative and accountancy elements of the company, as well as the supplier relations, direction of communication (headed by Jeremy's wife Sophie), customer service and website management departments. 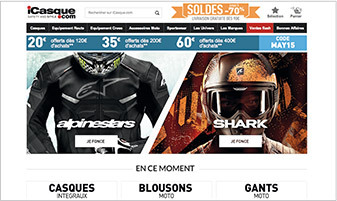 Today, iCasque is ranks well in the motorcycle equipment market in Europe. With more than 3 million visitors every year, 35 000 products on sale and more than 200 brands, iCasque has proven to be a successful family business. 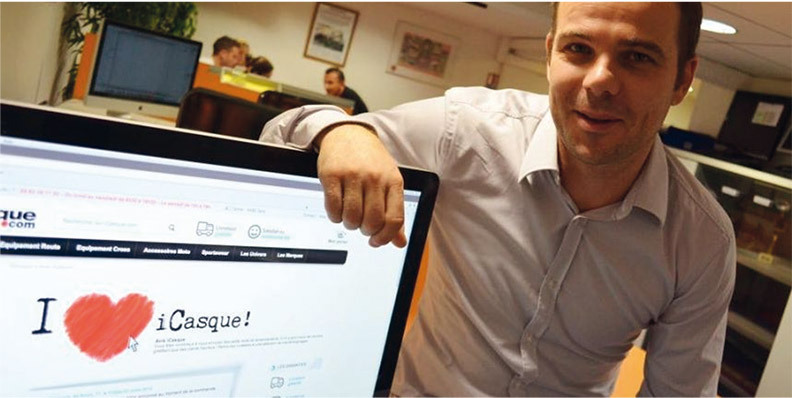 Towards the end of 2014, the renowned French financial daily « Les Echos » published an article in reference to the incredible success story of this entirley self-financed group. Due to growing, nationwide success, ICC decided in 2014 to take it up a notch, launching itself into the British, German, Italian and Spanish markets. This foray into the international market with versions of the website translated into each country's respective majority language will permit ICC to reinforce its position as a major player in motorcycle accessories on the European level. With this expansion, Jeremy Pasquetti, President of ICC, sees sales revenues surpassing 7 million euros as of the end of 2015 and a 20% growth in the number of users. The conquest of Europe however is only just beginning, with the directors of iCasque collaborating to continue to develop the foreign language versions of the website, inspired by the greatest of the current e-commerce sites.